Pictured here, the 1,000th Boeing Airplane for China departs Boeing Field in Seattle. SEATTLE, March 28, 2013 /PRNewswire/ -- Boeing (NYSE: BA) and China Eastern Airlines today celebrated the delivery of the 1,000th Boeing airplane for China, one of the world's most dynamic markets for commercial airplanes. Boeing forecasts that China will need 5,260 new airplanes, valued at $670 billion, in the next 20 years. 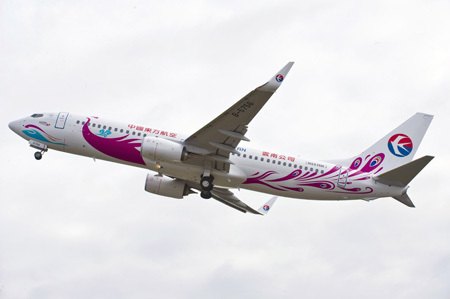 The 1,000th airplane, a Next-Generation 737-800 with the Boeing Sky Interior painted in special peacock livery, will join China Eastern Yunnan Airlines. China Eastern currently operates the largest 737 fleet among Chinese airlines. Boeing airplanes comprise the majority of commercial jetliners operated in China, providing dependable, efficient service to more than 20 different Chinese airlines. Chinese suppliers contribute parts and components to every current Boeing commercial airplane model, including 737, 747, 767, 777 and 787. Today more than 7,000 Boeing airplanes operating throughout the world use major parts and assemblies from China. Headquartered in Shanghai, China Eastern Airlines is one of the three major airlines in mainland China. Flying a fleet of more than 400 long-haul and short-haul airplanes with an average age of less than seven years, China Eastern Airlines serves nearly 70 million travelers annually and ranks among the world's top five airlines in terms of passenger transportation volume.